We are happy to announce that today we have released a new version of Handsontable. 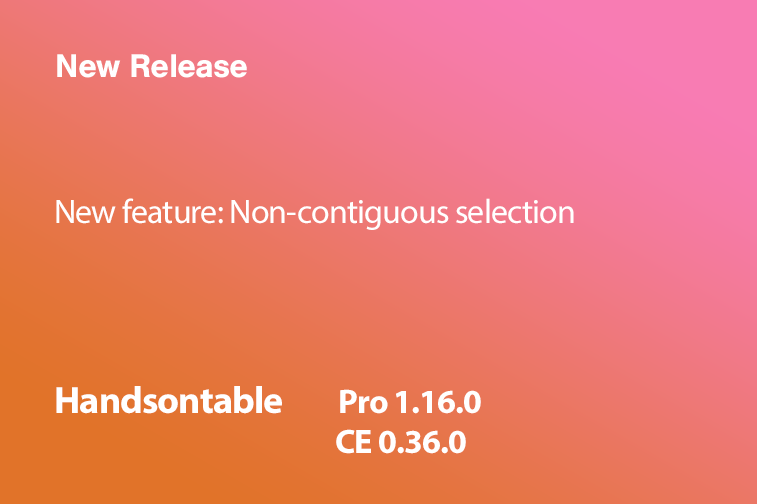 This version introduces a new feature called non-contiguous selection. It allows to select multiple, non-adjacent cells or ranges with mouse cursor or keyboard command. We also added new methods to the API making this feature a powerful tool. Read this tutorial to learn more. Added a support for selecting non-contiguous cells or ranges (#4708). That required making changes of which some are backward incompatible (see below). hot.getSelectedRangeLast() Returns a CellRange object containing the last selection coordinates applied to the table. This method behaves as hot.getSelectedRange() before the breaking change. hot.alter('remove_col', [[1, 4], [10, 1]]) Same as above, but for the columns. Only “remove” actions support that new feature. We’ve added a selectionLayerLevel argument for all the hooks listed above. The selectionLayerLevel is a number indicating which selection layer is currently being modified. For the first selection, this value is 0, with the new added layers this number increases.